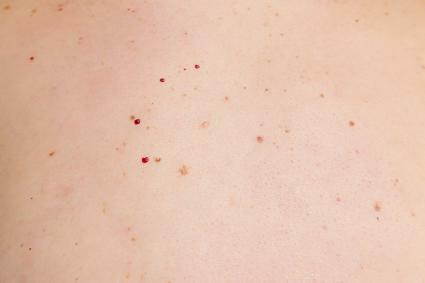 What most people refer to as red moles are actually cherry angiomas. According to MedLine Plus, cherry angiomas are common benign skin growths that consist of blood vessels. Medically known as Campbell de Morgan spots, these skin growths can appear at any location on the body, but most commonly appear on the trunk (also known as the torso). 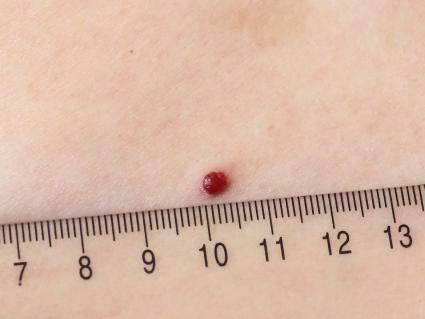 They can appear on men and women - and are most commonly seen on people over the age of 30.
as the mole increases in size, the cherry angioma may be one to two millimeters in width and up to one centimeter in diameter. The color of a cherry mole can vary, appearing bright red, blood red, or a deep shade of dark purple. 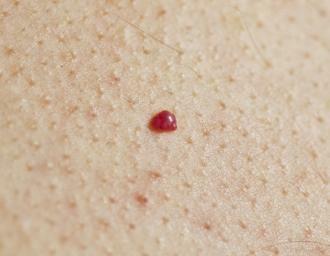 The small clusters of skin capillaries surrounding the mole are what create the red papule, also known as a "dome." Although most red moles are harmless, their location or size may make them undesirable. However, that doesn't mean you should stop practicing prevention. A monthly mole check will keep you aware of the size, location, and coloring of all of the moles on your body. Asymmetrical: Moles that are different on both sides are known as asymmetrical. Asymmetrical moles should always be evaluated. Imagine drawing a line down the center of your mole; if it appears grossly different, have it checked professionally. Borders: Malignant moles have irregular and jagged borders, which can be seen on the Skin Cancer Foundation article, "Do You Know Your ABCDEs?" Color: Moles vary in color greatly. Generally, the darker the mole, the higher risk of it being cancerous. Keep watch on the color of your moles. If they darken over a period of time, have them checked out. Diameter: Lastly, the diameter of a mole may suggest malignancy. Most benign moles are no larger than a pencil eraser. If your mole is larger, or continues to grow, it's time to a book an appointment with your physician. 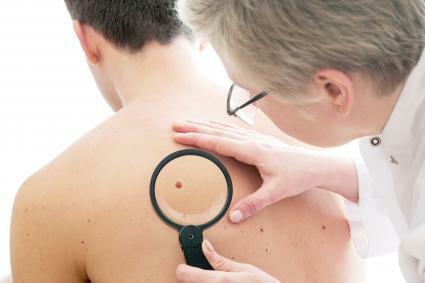 Keep check of your body's moles and when in doubt, see your family doctor. Any mole that suddenly bleeds, oozes or causes pain garners prompt medical attention regardless of the color or size. If there is any concern that a mole on your skin might be cancerous, see your physician. They may suggest that you have it removed. Cosmetic Purposes: Having a red-colored mole may not be something you want, especially if it is in an obvious or commonly seen area. For this reason, you might want to consider removal. Location: Sometimes, cherry angiomas appear on areas that are less than desirable. For instance, a woman may have one on her leg or another area that is shaved often. This can cause the mole to be cut, causing pain and irritation. Additionally, a mole may be in a spot that is frequently touched or scratched. This too can lead to irritated skin or bleeding. Electrocauterization: This is one option for the removal of red moles on the skin. Electrocauterization is a non-invasive surgery, where electricity is used to heat up the tissue. The small probe is able to burn off a wart or mole fairly easily - and usually with one visit. This is one of the most commonly recommended methods for cherry angiomas as it does not tend to scar. Pulsed Dye Laser: According to Baylor College of Medicine, the PDL targets blood vessels in the skin using a concentrated beam of light. That light is converted to heat, allowing it to burn off the red mole. This method is similar to the electrocauterization, but may require more than one treatment, depending on the number of moles being removed. Cryosurgery: Another way to get rid of a cherry angiomas is to undergo cryosurgery. It is used to treat many medical issues, including certain types of cancer, as well as wart and mole removal. Liquid nitrogen is used to freeze the red mole, destroying the mass in the process. This treatment method is quick and effective but can cause temporary numbness or tingling. Shave Excision: A less common removal method is the shave excision, where a doctor will slice thin layers of the red mole until it is completely gone. Alternatively, they may decide to cut the mole out of the body. When it comes to red moles, this treatment is not recommended as often. This is because it can result in scarring and tends to work best on moles that are quite raised. Tea Tree Oil: There are countless tea tree oil uses, ranging from makeup remover to cold sore remedy and even a treatment method for red moles. Apply this essential oil directly to the skin using a Q-Tip twice a day. If you have sensitive skin, dilute with olive oil, castor oil, or coconut oil. Apple Cider Vinegar: When it comes to skin care issues, apple cider vinegar is a must-have item. It can fight wrinkles, blemishes, and sun spots, and possibly even red moles. Simply soak a cotton ball in organic apple cider vinegar and apply it to the affected area once or twice a day. Castor Oil: Another option is castor oil. This can be used to hydrate the skin, reduce the appearance of scars and stretch marks, and may even diminish the appearance of moles. Begin by soaking a cotton ball in the oil and tape it on top of the red mole. Keep it on throughout the day and remove before bed. Repeat for a full week. Skin can change dramatically with age. For instance, you may discover small red moles that were not there before. The best thing to do is check each mole often and speak to a medical professional when necessary.